Hitachi Construction Machinery received an honorable mention at the 3rd Carbon Offset Award, which is sponsored by the Carbon Offset Network (CO‒Net)∗1. 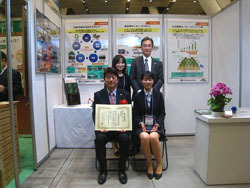 The award was presented on March 4, at the Carbon Market EXPO 2014, which was held at the Tokyo International Forum. 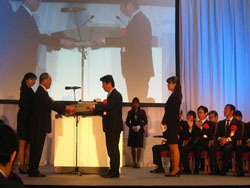 This award is given to organizations that implement particularly advanced carbon offset initiatives, with the aim of achieving a low‒carbon society. Hitachi Construction Machinery and Hitachi Construction Machinery Japan, which handles rental, sales, and services in Japan, have been promoting carbon offset measures since FY2008. The company was recognized for working with its customers to prevent global warming and to raise public awareness. The initiatives were introduced at Carbon Market EXPO 2014, and many visitors came to the Hitachi Construction Machinery booth. The Hitachi Construction Machinery Group is working to promote environmental management and environment activities. ∗1 Commonly known as CO‒Net, the Carbon Offset Network is an external department of the Ministry of the Environment.